Varadkar is listed alongside figures including Donald Trump and Millie Bobby Brown. TAOISEACH LEO VARADKAR has been selected as one of Time magazine’s 100 most influential people for 2018. Varadkar is listed among global figures including Donald Trump, Kim Jong Un and Meghan Markle, pop culture figures including Stranger Things actress Millie Bobby Brown and singer Jennifer Lopez and athletes including US snowboarder Chloe Kim and tennis player Roger Federer. 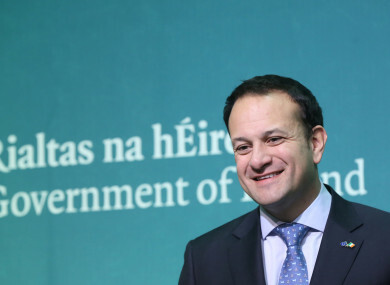 Varadkar’s entry was written by journalist Philip Ryan, co-author of a new book, Leo Varadkar – a Very Modern Taoiseach, alongside Niall O’Connor. Ryan serves as political correspondent for the Sunday Independent. Ryan’s entry depicts Varadkar as a symbol of how much Ireland has changed over the past 25 years. Twenty-five years on, Ireland is a very different place—symbolized by the rise of its new leader, Leo Varadkar. The openly gay son of an Indian immigrant, Varadkar decided to come out publicly in the run-up to the world’s first marriage-equality referendum. Today the once anti-abortion politician is campaigning to significantly liberalize the country’s abortion laws. Ryan also highlights the role that Varadkar will play in Brexit negotiations, as well as managing the housing crisis. The country’s youngest-ever Taoiseach will be judged on how he guides his nation through these challenges. This year’s list, the magazine acknowledges, “looks quite different than in the past”. As well as a record number of women, the list is the youngest it has ever been, with a record 45 people on the list under 40 years of age. Aged 39, Varadkar forms part of this change. “Time’s annual list of the world’s most influential people is a designation of individuals whose time, in our estimation, is now,” the magazine states. Varadkar was on the cover of Time last year, with a quote from him on the cover describing Ireland as “an island at the centre of the world”. In the interview, entitled A Portrait of the Prime Minister As a Young Man, Varadkar focused on Ireland’s relationship with other countries, discussing his relationship with Trump and Canadian Prime Minister Justin Trudeau and defending the country’s corporate tax rate. Email “Varadkar makes Time's list of the world's 100 most influential people”. Feedback on “Varadkar makes Time's list of the world's 100 most influential people”.